Tire Top Off from Slime is a really unique product. When I saw it, I was really impressed and wanted one in my glove box. Tire pressure maintenance can be simple. Simply store the compact inflator in your glove box and use it regularly to check tire pressure. If your tire is low on air pressure, just plug the power cord into your accessory outlet and top off the air. In minutes, your tire is back to its optimal pressure. 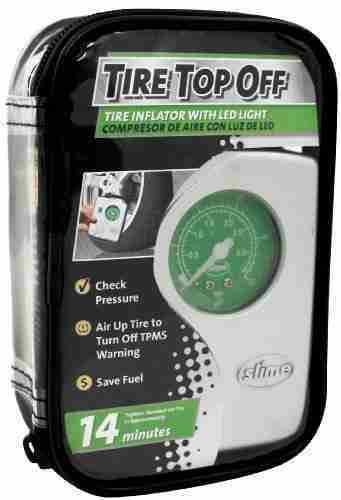 The Tire Top Off even features a built in light, for convenient nighttime use. The Slime tire inflator will help your vehicle achieve optimal fuel economy, maximize tire tread life and ensure proper vehicle handling. * Remember your correct tire pressure information is located inside the driver’s side doorjamb. Slime Tire Top Off is only $12.99 and makes a great gift too.